They call it ‘dharm-sansad’ but why should we need it when we have the ‘sansad’ elected by the people. But dharmsansad actually is the brahmanical monopoly over us. It is meant to maintain it because politically elected ‘sansad’ has given representation to diverse sections of our society. Political elected sansad discuss, debate and decide but the dharmsansad has no faith in discussions and debates as they only believe in dictating things. When the matter is in the court, it should be allowed to be decided by it but then a political party and its father organisation from Nagpur never believe so because they have nothing to showcase to the people of India. They want to change the popular narrative and for every question you ask, it look that Jawahar Lal Nehru was responsible for even our asking the question. Perhaps, that might be right too as whatever be the weaknesses, Nehru definitely remain of the most outstanding architect of modern democratic India. Tomorrow, we remember our constitutional forefathers on the Constitution Day and Baba Saheb Ambedkar rightfully warned us that if the country is unable to resolve the social and cultural inequalities in the form of caste discrimination based on the birth based identities, India’s democracy will be in peril but rather than fighting against the discrimination on war footing, the forces of the status quo are working against it and have waged a war against the constitution. धर्म संसद संविधान विरोधी है क्योंकि उसमे आने वाले मनुवादीयो की भारत के संविधान में कोई भी आस्था नहीं है. ६ दिसंबर को बाबरी मस्जिद का ध्वंश असल में भारत के संविधान पर हमला था. आज संविधान विरोधी, आरक्षण विरोधी ब्राह्मणवादी शक्तिया फिर लामबंद हो रही है. सामने निशाने पर मुसलमान जरुर दिखाई देते है लेकिन दरअसल असली निशाना दलित पिछडो और आदिवासियों में हो रही जागरूकता है जो अपने अधिकारों के लिए लगातार लड़ रहे है और बाबा साहेब आंबेडकर के दिखाए रास्ते पर चल कर आधुनिकता की और बढ़ रहे है. कुंठित मनुवादी शक्तिया उनके बढ़ते कदमो को रोक देना चाहती है इसलिए ये पूरे खेल खेले जा रहे है. हिंदुत्व में दलित पिछडो को अपने अजेंडे में धर्म के जरिये घुसाने की कोशिश की है ताकि वे अपने अधिकारों की लड़ाई भूल जाए और फिर उसी वर्ण व्यवस्था को मज़बूत करे जिसका वह शिकार है. A friend has just written that Bible, Gita aur Quran are not in danger but the constitution of India. Yes, it is the constitution of India which gives us right to change even a law which otherwise our religious texts would not allow. A text in any religious book is unchangeable but the quality and specialty of the modern laws is that we know that the need of the people changes according to time. The big congregation in Ayodhya is nothing but an attempt to divert people’s attention from the ongoing elections in the state as well as to polarise the atmosphere throughout the country and prepare the grounds for the upsurge of Hindutva before the elections. As I said so many times, that this government seems to be at war with its own people. it has no faith in rule of law as a majority of the lawmakers have more faith in Manuwad than the constitution of India. The question is when the matter is pending in the court, where is the need to rush to Ayodhya, a tiny city of around one hundred thousands people. Today, the city of Ayodhya and Faizabad will have huge gathering of outsiders who want to convert the city into a war zone as they did it on December 6th, 1992 when they razed the constitution of India to the ground. Whatever be the weaknesses of Indian state, technically, it remained a secular state which we all felt proud of. Our neighbors too were envious of us because of the political freedom but look at the irony Pakistan has consistently trying to cleanse its image by doing things which would gladden the heart of those who are concern about minority rights. The opening of Kartarpur Saheb corridor and invitation to Indian leaders to participating in the ground breaking ceremony of the place has given Pakistan good will among the Sikh community too. A few months back when Navjot Singh Siddhu attended the swearing in ceremony of Prime Minister Imran Khan and hugged the Pakistani General, the C grade Indian anchors targeted him for disrespecting the martyrs of India. Today, the Narendra Modi is talking about people contact and comparing the Kartarpur Saheb corridor as breaking of Berlin Wall but does Modi really feel that people to people contact also include Muslims of both the sides who have been the victims of the partition, a blame for which they are still being punished. What will government of India do to increase people to people contact. Does it only mean Hindus from Pakistan and Bangladesh along with Sikhs are welcome in India but not the Muslims. The ruling party and its motormouth leaders are trying to convert India into a brahmanical theocracy and they have succeeded though partially but it wont stay long as whatever exercise they may initiate to divert people’s attention, the question of participation in power, in job and a demand for equality will always be there. Ayodhya’s Ram temple cant resolve our hunger crisis. Strange thing is that Lord Rama has been separated from Sita. If you see the initial calander, Rama was always seen with Sita, Lakshman and Hanuman and that made the perfect picture for many who considered they ideal but the Hindutva want a macho image of Lord Rama and hence they are popularising his single image. How dangerous that could be. If our anchors and reporters have time. Travel to Uttar Pradesh Poorvanchal and Bundelkhand regions with in the vicinity of 200 kilometers of Ayodhya and Varanasi and you can find numerous families still living in abject poverty, hunger as well as suffering caste discrimination untouchability. Today, a huge number of people who would be congregrating there may be of these communities too. Will your Dharmsansad ever give a call against caste system and untouchability. No, they will try to justify it. The Uttar Pradesh government will invest thousands of crore rupees for building statue of Lord Rama. Huge amount of Land will be acquired. We dont know how much but I am sure, the poor Dalit Bahujan communities, farmers would be targeted. For ‘nation’ building, we will ask for the ‘sacrifices’ from the rural poor while the manuwadis will enjoy the political lime light. We want to ask the government where is going to acquire land and whose land for this. Yes, they want a big museum for Lord Rama. We hope the museum have Shambook too as well as other stories of how Bali was killed. It is important to explain to people as why was he killed. BJP consider Dr Baba Saheb Ambedkar as their ‘pratahsmaraniya’, the person who is revered in the morning. A museum for Lord Rama should definitely have great work of literature on him. Will the Sangh Parivar who claim to love and respect Baba Saheb Ambedkar, put his critique : Riddles of Hinduism and Riddles of Rama and Krishna in the museum so that people are allowed to know the other side of the story too. We sincerely hope that the administration will uphold the rule of law today and will not allow things to go out of hand. How ironical is it that a party which rose on the anti north Indian sentiments in Maharashtra today is raking up the issue of building up temple of Lord Rama in Ayodhya. Channels are working over time to make Ram Temple a national issue. Temple construction has become a national ‘sentiments’ in which Muslims have to contribute with their all might, they say. My question to all the bhakts is same. If the Muslims contribute to build the temple in Ayodhya then will the war cries end. Will they stop their insanity on building up temples everywhere ? Will they stop crying against Muslims then. It is deeply distressing how the Manuwadi forces just to maintain their hegemony are out and out ready to destroy our plural fabric, our constitution and our rule of law. The Supreme Court has a bigger task ahead of it now. A strong message to all must go from the Court that any violation of its order will mean contempt of the court and severe punishment and not merely a symbolic punishment of Kalyan Singh type which made him hero of the event. We request the administration of Ayodhya and government of Uttar Pradesh to ensure confidence among the Muslims of the region who are fleeing as per reports out of fear. This is dangerous. The home minister must speak and assure the nation about this. India can not and should not be allowed to be bullied by a religious frenzy mob. 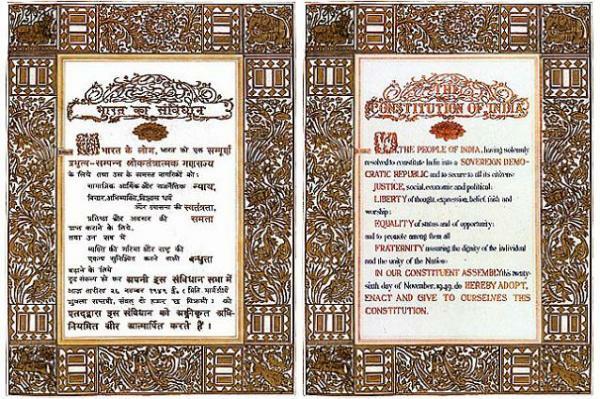 The Supremacy and sanctity of the constitution must be maintained as it is the only binding force in India. Any failure of it will only be detrimental to our unity and integrity. अयोध्या में सुप्रीम कोर्ट के आदेशो का पालन होना चाहिए. आज वहा का मुसलमान तनाव में है और बहुत से लोगो के घर छोड़ने की खबरे भी आई है. केंद्रीय गृह मंत्री को इस सन्दर्भ में देश को आश्वस्त करना होगा. संविधान के साथ धोखा बर्दास्त नहीं किया जा सकता. भारत की एकता और अखंडता को कायम रखने के लिए संविधान की सर्वोच्चता और पवित्रता का सम्मान करना होगा और उसकी पूरी जिम्मेवारी राज्य सरकार और प्रशासन की है लेकिन केन्द्रीय सरकार और उच्चतम न्यायालय को स्थिति पर पूरी नज़र रखनी होगी. हम आशा करते है के लोग कानून के दायरे में रहकर ही अपनी बैठक करेंगे और किसी भी प्रकार के गैर कानूनी हरकत नहीं करेंगे ताकि पूरे क्षेत्र में शांति और सौहार्द का माहौल बना रहे.